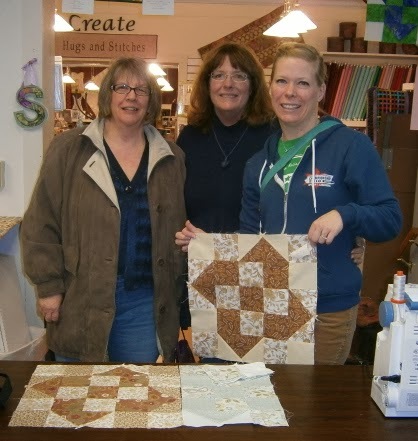 Sue Knapp of O'Susannah's Quilts and Gifts interviewed me by phone last week, and her blogging partner Betsy Alderman Lewis posted a blog based on that interview. You can read it at osusannahsquilts.wordpress.com. 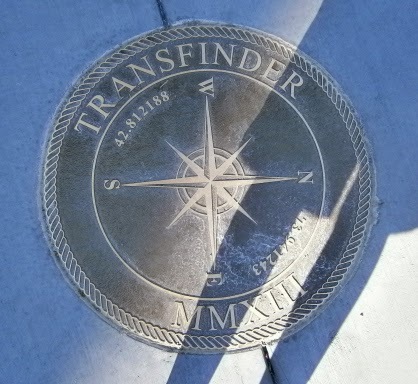 It's also a chance to get a closer look at some of the new Mariner's Compass blocks! You may even discover some things you didn't know about me--or had forgotten! It's been cold, blustery, and snowy here today. We are 20 degrees below normal for temps. A great day for staying in and working in the sewing room. I put binding on a good sized wallhanging (pics when the hand sewing is done), finished handouts for a labeling class happening soon, and repacked for an upcoming binding class. Okay, it's a short post--but it's a post--and it's earlier in the day than usual! P.S. You can visit Sue's website at osusannahsquiltshop.com,and Betsy is at BetsyLewisWrites.com. Thank you, Ladies, for the great interview! At the beginning of the month I had the good fortune to venture to Schenectady, New York, to visit the Q.U.I.L.T.S guild. 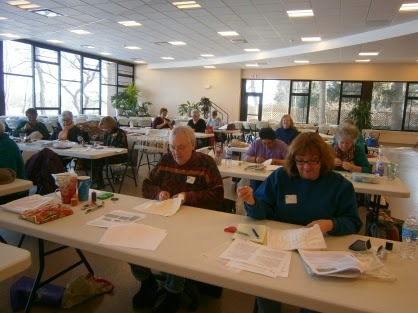 Q.U.I.L.T.S stands for Quilters United In Learning Together, Schenectady. 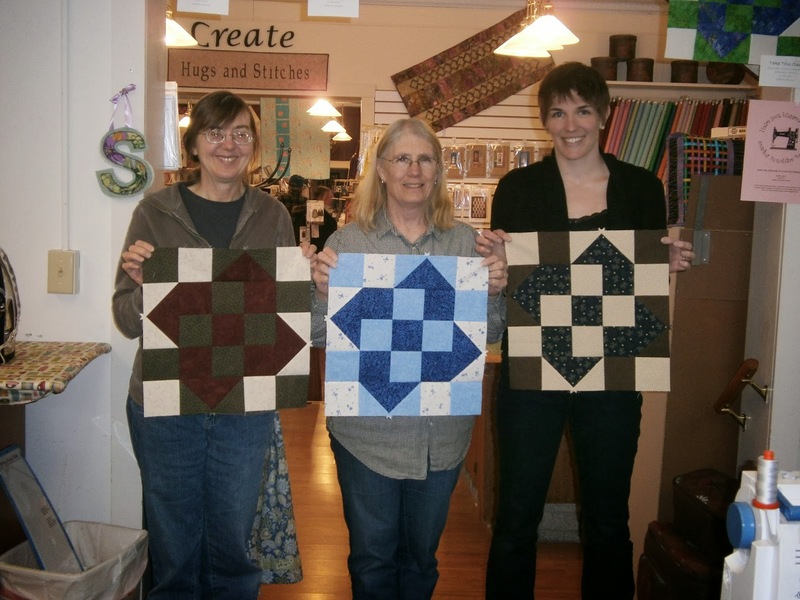 These are wonderful women who came to learn my method of hand quilting. 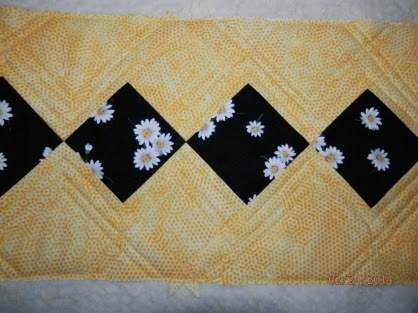 Some had been thinking of giving up hand quilting because of problems with their hands, but all came with an open mind. The smiles and excitement these ladies felt when they could achieve beautiful stitches, front and back, while NOT poking their underneath fingers, was fabulous to see. We had excellent natural light from the wall of windows on the left side of the pictures. In the very top one you can see the frozen river...and lots of snow! It seemed like a good omen for finishing my Mariner's Compass! And yes, those are my legs, and yes, I was wearing a skirt! Thank you, Schenectady ladies, for a great time! I know you thought it would never happen--and there were days neither did I--but it's true. The Mariner's Compass Bliss top is done. You've seen bits and pieces of it over the course of these past months. And it looks just like I thought it would! All the stars/compasses are hand pieced; the top is set by machine. For those brave students who have been working on this quilt without seeing a finished top, thank you for your faith. P.S. Laurie, that hand scrub is the bomb! Thanks for sharing! A couple weeks ago I had the urge to make a small runner to fit my sewing room window sill. I had a piece that fit, but it had pointy ends and I wanted to cover as much space as possible. 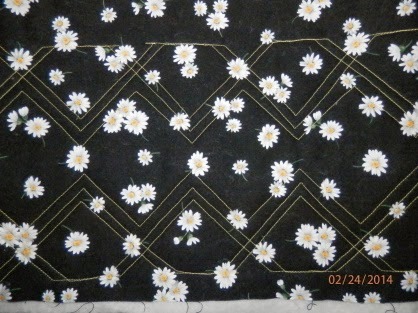 I had leftovers from another quilt top I had recently finished and a pattern (Skinny Mini by Joan Ford). 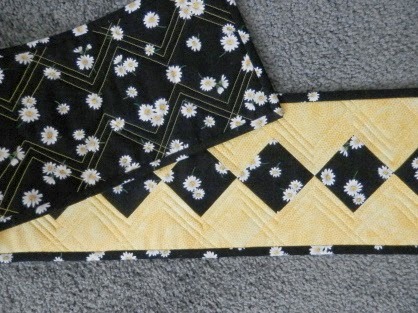 Here's the basted sandwich, ready for quilting. The view from the back. We'll just call the quilting "folk-arty". The straight lines at the edges are traveling lines and are covered by the binding. And here it is with the binding all done. I was so excited to actually complete a project in a short time. I cleaned off the window sill, laid the runner on it, and...it was too long! The ends went up the sides of the window frame! So I got out the one I had measured before, counted the blocks--and they were exactly the same! I'm not sure how the second one grew about two inches.... So I put the pointy ended one in the window and now am looking for a place for the daisies. I was ironing today and the bookcase near the ironing board looks like a candidate. The best laid plans, you know! P.S. You can visit Joan Ford's website www.hummingbird-highway.com and blog www.scrap-therapy-quilts.blogspot.com. I'm not sure if the Skinny Mini patterns are still available, but there are tons of cool things on both sites. The Skinny Mini pattern I used was Roberta. 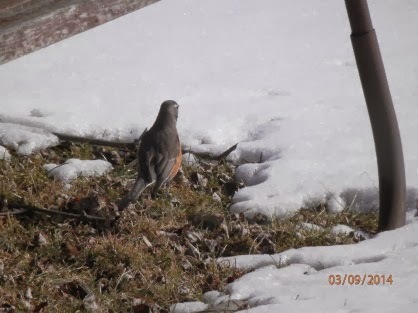 On March 9, just three days ago, I saw my first robin of the year. Later I saw the rest of the flock. Do you think they were premature? 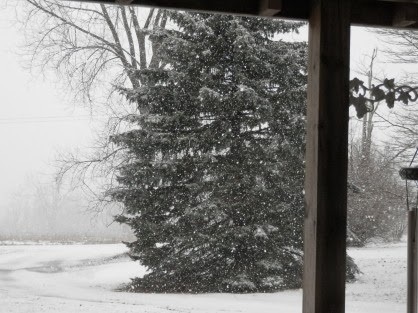 This is the view out the front door as the snow was starting this afternoon. When you look at the spruce you can see how hard it was snowing! Flakes the size of half dollars. At almost 11:00 pm, it is almost white-out and the wind is blowing steadily. 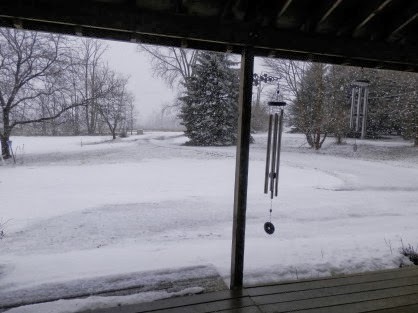 Snow is definitely accumulating, and wind chills are well below zero. So what else is new? 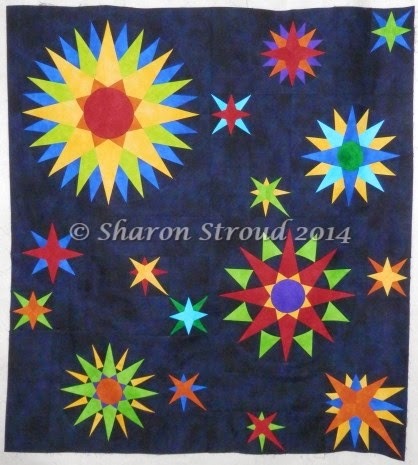 Today and tomorrow are perfect days to stay in and quilt! Personally, I've been working on hand-outs for the new classes--and dreaming of my next project. I have one more finish which I will share tomorrow! 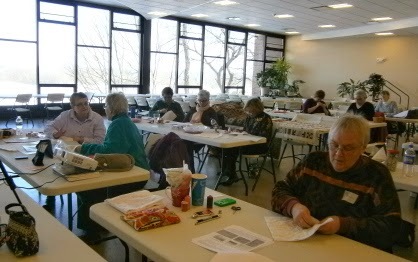 On March 1, eight eager ladies joined me for the Big Three: Rolling 9 Patch class at O'Susannah's in Watkins Glen. We spent the day rotary cutting, precision machine piecing and pressing these 15 inch finished blocks. The special skill for this particular block was forming flying geese units the old fashioned way--with quarter- and half-square triangles! No special rulers, no making four at a time, no using rectangles and squares. No waste. And absolutely perfect! It was a fun day and we laughed lots. Great job, ladies, and thank you for sharing! The weather--okay, I'm not even going there.